Facilities: FCI El Reno, with an adjacent minimum security satellite prison camp. 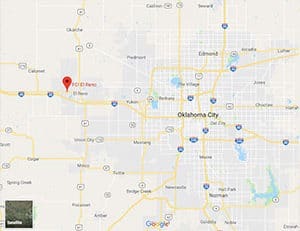 Location: FCI El Reno is located 30 miles west of Oklahoma City. Background: FCI El Reno is located on the Fort Reno Military Reserve. It was opened in 1933. From the beginning, FCI El Reno was designed to house younger prisoners aged 18-26, until the late 1970’s when it opened to all age groups. The satellite camp opened in 1980. President Barack Obama visited FCI El Reno in July 2015, making him the first sitting President to ever visit a federal prison. Housing: Inmates are housed in two-person cells. Inmates at the camp are housed in dormitories which are divided into two and four person cubicles. Health Services: Sick call, dental care, emergency treatment, chronic care, preventive health care services, emergency services, diagnosis and treatment of chronic infectious diseases, mental health care, substance abuse treatment, and medications are all available at FCI El Reno. Emergency health care is available 24 hours a day. Psychology Services: Psychologists are responsible for providing a full range of professional psychological services. Psychologists also aid staff members through program design, consultation, and training. Services for inmates include evaluations and therapy. Common treatment groups include anger management, HIV/AIDS awareness, and criminal thinking. Residential Drug Abuse Program (RDAP): FCI El Reno houses a Residential Drug Abuse Program (RDAP). The camp does not house a Residential Drug Abuse Program (RDAP). The facilities also provide a Drug Abuse Program, Drug Abuse Education Course, and Non-Residential Drug Abuse program (NR-DAP). Education Services: FCI El Reno provides literacy, GED, and English-as-a-Second Language (ESL) programs. Other educational offerings include parenting and Adult Continuing Education (ACE) classes. High school diplomas and post-secondary programs are available through paid correspondence programs. Advanced Occupational Education: FCI El Reno offers advanced occupational education in Culinary Arts, Electric, Plumbing, Purchasing Agent, and Welding. The camp offers Diesel Repair and Horticulture. Vocational Training: No vocational training is available at FCI El Reno aside from its advanced occupational education programs. Apprenticeship: FCI El Reno offers apprenticeships in Dental Assistant, Drafting, Machinist, Millwright, Painter, Quality Control, Tool and Die Maker, and Welding. The camp offers an apprenticeship in Dental Assistant. Library Services: FCI El Reno offers a legal and leisure library for inmates. The legal library primarily consists of the Bureau’s TRULINCS Electronic Law Library computers. Typewriters and a copy machine are also available. The leisure library permits inmates to check out fiction and nonfiction books, newspapers, and magazines. UNICOR: The FCI El Reno UNICOR facility produces office furniture and industrial products. The satellite camp does not house a UNICOR facility. Commissary: Inmates at FCI El Reno are permitted to spend up to $360.00 per month in commissary purchases on their designated shopping day. Items such as food, drinks, clothing, and electronics can be purchased. Recreation Services: Recreation services at FCI El Reno include areas for both indoor and outdoor activities, which include field games, court games, tabletop games, individual events, arts and crafts, team sports, space for music enthusiasts, and television. Basketball, flag football, soccer, and Frisbee are all popular sports leagues.